Huddle rooms are the result of changing demographics and financial mandates to make efficient use of space. They continue to drive change in how we meet. Traditional conference rooms continue to serve an important role for larger meetings. Huddle rooms and huddle spaces, however, proliferate as an important way to hold more immediate, intimate gatherings. Finding the right balance between the two can result in an increase in productive work time and a decrease in wasted space. Huddle Rooms: Who Needs Them? Sure, huddle rooms are all the rage. But they’re far more than a mere design trend. Huddle rooms deliver compelling business benefits – not the least of which is cost savings. Huddle rooms are the antithesis of the formal conference room. They’re small, convenient meeting spaces that enable a few employees to quickly meet. They eliminate cumbersome reservation processes. And they’re all about ad hoc conversation. Huddle spaces lose the walls and serve the same purpose within open areas. Either way, huddle areas facilitate informal closeness and easy collaboration. Small and intimate. Huddle spaces typically accommodate groups of 2 – 5. Informal. Need a quick conversation with coworkers? Huddle rooms let you drop-in as-needed. Freedom from scheduling is a key factor. Versatile. Huddle spaces are available as-needed to support any business objective. They’re outfitted with a range of furniture, equipment, technology to support these needs. All about spontaneous collaboration. Huddle rooms enable a spontaneous, collaborative flow of information. 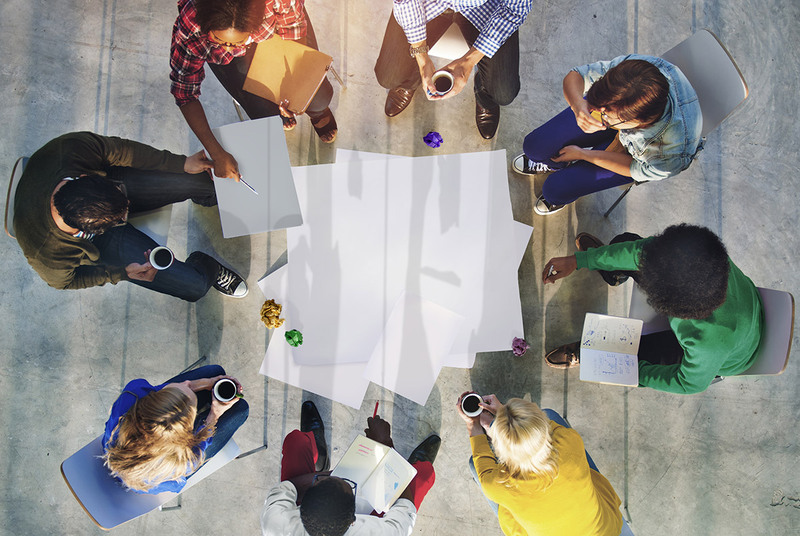 Why are Huddle Rooms Growing in Popularity? The open floor plan is praised for boosting collaboration. It encourages flow of information across the workplace. Embraced for cost-cutting advantages, open layouts maximize existing space while minimizing costs. This is helpful in the era of greater telecommuting, where cubicles are less used.5 Open space also eliminates areas used for small, informal conversation. The private office. The partially-enclosed cubical. Employees, it turns out, craved closed-in spaces to meet with colleagues. The solution: the huddle room. Mobile technology revolutionizes when, where and how we work. With more employees traveling or working remotely, fewer are in the office full-time. This leaves valuable office real estate vacant.6 Those who are in the office often choose their own devices over a desk-bound company PC. The huddle room provides a cost-saving, productivity-boosting solution. When remote and traveling workers are in the building, huddle rooms serve as the offices that went unused. The value of collaboration continues to grow. As such, companies increasingly rely on distributed work teams. Traditional conference rooms can, in theory, hold two or three groups working on separate projects. However, this results in distraction, a loss of privacy, and decreased productivity. The alternative is to let one group at a time reserve and use this large meeting room. This, however, can result in rushing, delays and incomplete discussions. Again, huddle rooms are the logical solution. Millennials – the 55 million adult Americans between ages 18 and 34 – came of age surrounded by technology. They now account for 30% of today’s workforce (largest).7 They didn’t have to adapt to new technologies.8 They were born with them. This is having a massive impact on the US workplace. Millennials have distinctly different work styles and expectations than prior generations. They fully expect to leverage the latest tech tools. Millennials are highly motivated by peer relationships. They crave collaboration, work best in teams and like frequent feedback. They are passionate about working with the latest technologies.9 Millennials are expected to make up 40% of the workforce by 2020 and 75% of it by 2025. 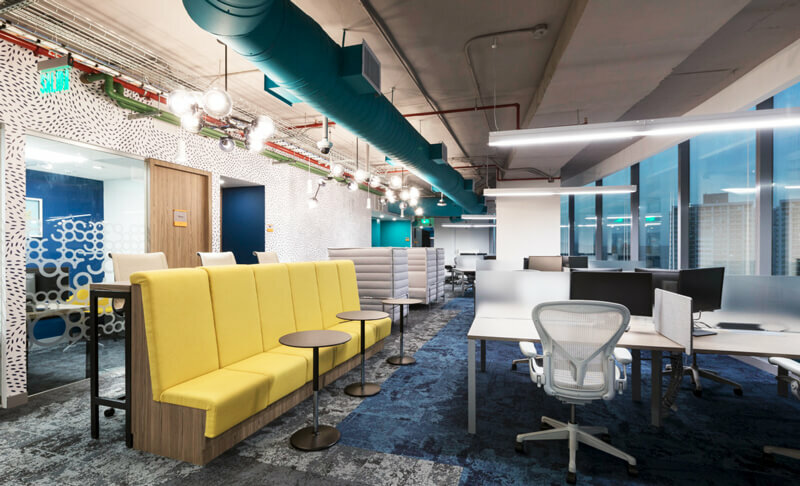 The need to support a team-based workplace climate will likewise continue to increase.10 Huddle spaces provide an ideal place for this type of interaction. The qualities making huddle spaces valuable also make them challenging to equip. Huddle rooms are often misunderstood, mismanaged, and under-appreciated spaces.12 One of the greatest risks is that companies may treat huddle spaces as scaled-down conference rooms. Among the downfalls of this approach is thinking huddle rooms can completely replace larger meeting spaces. The converse concern is that equipping huddle spaces as robustly as conference rooms will diminish their immediacy, intimacy and informality.13 This conundrum can make it difficult to determine how to outfit an effective huddle space. "If the need for a huddle room is clear, its definition, particularly in terms of audio and video technology, is less so," says Infocom reporter Dan Daley. Huddle rooms should look and feel different than standard meeting rooms. Additionally, their design should vary based on each company’s needs. It may also vary within any given enterprise. Huddle spaces can fall within a continuum of formality. Some huddle spaces may be outfitted with sofas and beanbag chairs and exude relaxed brainstorming. Others may evoke a café-style conversation with high tables and stools. Some will feature traditional, sized-down meeting tables, chairs and whiteboards. There’s no such thing as a one-size-fits-all huddle space. At best, there seems to be agreement on several setups that span the options. These include huddle rooms and/or huddle spaces that are minimalist, basic, mid-level and high-end. At its most basic, a walled huddle room will include a central surface (table or other furniture) with -4 chairs. It will contain one or more whiteboards or a display device.16 Some AV and space planning pros set a higher bar for basic huddle rooms, however. They recommend including a conference system with speaker and microphone. They also suggest incorporating a short throw projector or touchscreen display and a collaboration app for content sharing. 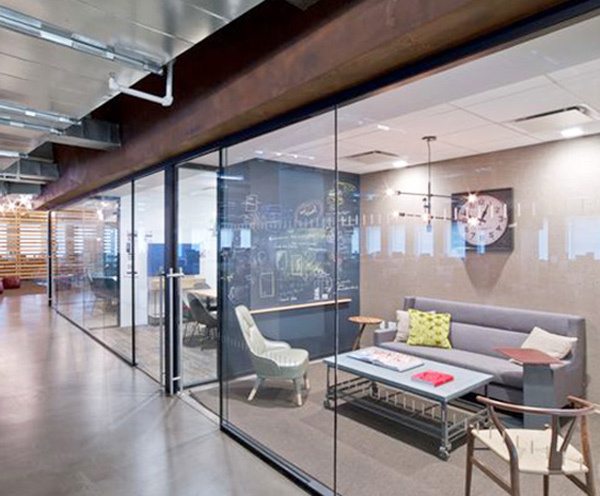 They may be set off from the office by partitions, glass walls or other design features. 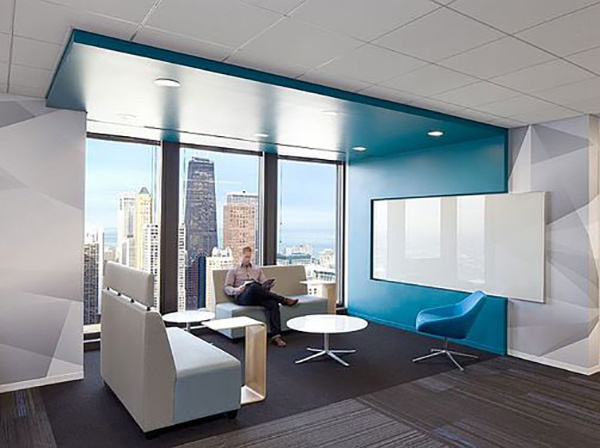 Basic huddle spaces are often based on systems from office furniture makers like Steelcase. Typical configs include a small table with integrated tech for charging and connectivity. This includes two to six chairs and one to three displays. These spaces are integrated into the general office space but are more formal and have more tech than a minimalist huddle space. Many companies equip huddle rooms with added tech for enhanced closed-door collaboration. This can include ceiling- or table-installed speakers and mics, headsets and a video conferencing camera. These rooms may include a telephone and network connectivity. They may also expand viewing with an LED display or an interactive display/projector. Tech may be provided to enable users to stream content from their personal devices. Extensively-equipped huddle rooms are far from the norm. 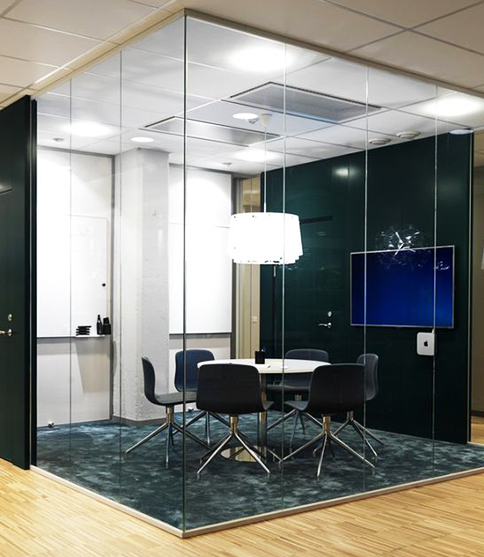 These rooms run the risk of becoming mini-boardrooms. This may cause them to lose the immediacy that makes huddle rooms powerful collaboration spaces. Nonetheless, AV analysts admit high-end huddle rooms offer tools to enable a wide range of collaborative functions. These amped-up rooms add to the capabilities offered in typical huddle rooms. They may include multiple wall-mounted digital displays or built-in video conferencing systems. ViewSonic ® is a leading worldwide visual solutions provider with over 25 years of delivering innovation to the enterprise. We are proud to offer a wide range of products ideal for outfitting effective huddle rooms and huddle spaces. ViewSonic offers displays in a range of sizes to enable a just-right fit for any huddle space. Commercial-grade large-screen displays from 32" to 98" provide high-visibility, wall-mounted use. ViewSonic interactive displays encourage engagement and empower collaboration with the familiar feel of a tablet or smartphone. Designed for durability, with scratch-resistant glass and rounded corners, these displays are tough enough for today’s in-demand huddle rooms. They withstand heavy use while maintaining their smooth, responsive touch. Interactive displays increase the business benefits of videoconferencing. In turn, they help reduce the amount of time wasted in meetings. Interactive models are available in sizes for the desktop from 22" to 27". Wall-mounted commercial-grade models come in sizes from 32" to 98". Our projectors are durable, compact and cost-effective, making them an outstanding option for many companies. ViewSonic short-throw projectors enable big, bold images in intimate huddle room spaces. They offer a range of breakthrough technologies for outstanding functionality. These include SuperColor™ for vivid, true-to-life images and SonicExpert® for fill-the-room sound. The hidden PortAll® compartment enables easy wireless media streaming. The ability to network projectors enables easy management and maintenance of all huddle room projection assets from a single PC. The ability to easily share content on a display expands a workgroup’s collaborative capabilities. Ideally, everyone who walks into a huddle room will be able to quickly connect, share and manipulate content. ViewSonic delivers this functionality via several technologies. These include ViewBoard Cast for Windows and Intel Unite. ViewBoard Cast for Windows lets up to four users share content from any digital device. Freedom from cables adds ease and productivity to ad hoc meetings. Productivity is boosted by the ability to annotate content in real time. Participants can then stream and share content onto a ViewSonic large format display. Intel Unite delivers premium enterprise performance and security for collaborative meetings. Offering easy, cable-free connectivity, the Intel Unite solution gets meetings going faster for added productivity. Intel Unite integrates easily with ViewSonic® ViewBoard® Interactive Flat Panel Displays and enables co-workers to connect and interact with meeting content in real time, with virtually any device and from any location with a corporate network connection. Intel Unite provides seamless integration with leading enterprise apps and plugins such as Zoom, Go to Meeting, Logitech, Outlook Express and many more, making it easy to launch your preferred conferencing tools from within the Unite platform. AV analysts agree huddle rooms are here for the long haul. Increasingly, these cost-effective, collaboration-boosting spaces are showing up on architect’s blueprints for new office development.19 Huddle rooms and huddle spaces, however, will proliferate as an important way to hold more immediate, intimate gatherings. Finding the right balance between the two for your company’s needs results in an increase in productive work time and a decrease in wasted space.